Dharmavahini TV is an Indian Channel Telecasts everything about buddhism on air. No Access to Sinhala TV Channels in the Country where you work, stay? and unable to access any Sinhala TV Channels? don't worry! You are just a click away. Watch Dharmavahini online with Yupp TV which provides all the programs in Dharmavahini to the indians who live abroad. 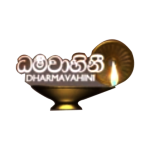 You can enjoy spiritual programs in Dharmavahini online with clear and uninterrupted videos ,This Channel is Dedicated to all the NRIs who are fond of Sinhala TV Channels, and for those who want to see programs which telecast in Dharmavahini TV Live, You can watch anytime anyplace, just open YuppTV and watch on live. If you are a fan of Dharmavahini TV and this is the place for you to watch live.